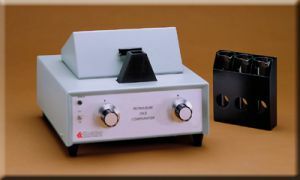 Product Description The Koehler K13200 Petroleum Colorimeter grades and compares petroleum oils and waxes according to ASTM D1500 specifications. Color discs situated on either side of the sample contain standards conforming to the chromaticity coordinates of ASTM D1500. Rotate the discs by turning dials on the front of the comparator until the sample color matches the color standards and take the reading directly from the dials. Two-disc configuration offers a distinct advantage over single-disc systems - the sample is always bracketed between the next lower and higher color standards allowing the viewer to easily determine the actual sample color. Comparator may also be used to quickly determine if a sample falls between two predetermined color limits. View the sample from either a standing or sitting position through a prism eyepiece that brings the standards and sample together in a three-field comparison. A detachable prism light shield may be inserted to eliminate any outside light interference. Color corrected filtered halogen light source corresponding to Illuminant C of the CIE system provides clear visibility, assuring accurate readings. Conforms to: ASTM D1500, D6074; IP 196; ISO 2049; FTM 791-102. Included accessories are a Light Shield, 3 Sample Containers and a Calibration Certificate.